Delta is currently having one of their unadvertised fare drops, similar to what I reported on November 15 here on the blog. It didn't last long last time, so if Delta dashed your travel dreams when they quickly put the prices back up, this might be your chance. This time, Chicago looks to be included as one of the cities that is being offered at the cheap price. There also looks to be a few cities that were not included this time around, including Atlanta, Memphis, and Minneapolis. One of the reasons it's so interesting is that it's affected dates as far away as October 2013, and there even looks to be cheap ones available in the peak months of July and August, with the next cheapest airlines having fares that are 40% higher. vancouver, yvr, flight deals, delta, chicago, ord, washington dc, memphis, mem, atlanta, atl, united states, phoenix, phx, dca, salt lake city, slc, cincinnati, cvg, denver, den, houston, hou, minneapolis, msp, detroit, dtw and iad. 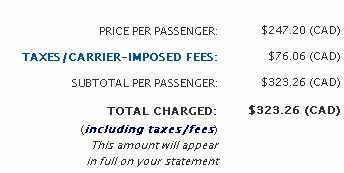 One Response to "Crazy unadvertised Delta deals are back! Chicago included this time - from $323 roundtrip after taxes"